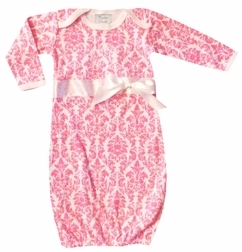 We start with a premium 7.5 oz 100% cotton interlock knit fabric pink damask infant gown constructed specifically for embroidery and monograms. 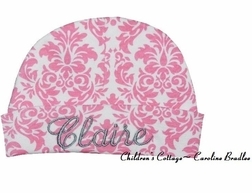 It is made with long sleeves that keep baby cozy and warm all year. The gown is embellished with a delicate satin ribbon and little bow, and the baby's initials monogrammed in Fancy Script font. These gowns are wonderfully traditional, and perfect for bringing that sweet baby home from the hospital (and don't forget to use the gown for pictures at the hospital! ), outings with Mom and Dad, and as new baby~baby shower gifts. 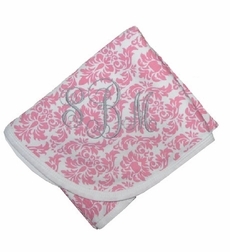 AND, to complete the outfit, purchase the beautiful matching damask cap and blanket!